Lularoe Review - Fashion Empire or Clothing Pyramid? Must Read! Please note, I am not a member or an affiliate of LuLaRoe. This review has been researched with information and testimonials that are available online in the public domain. Any conclusions drawn by myself are opinions. LuLaRoe is a direct selling clothing company founded in 2012 by Deanne Brady (Stidham). As a single mother with 7 children and a background in network marketing, she was inspired to start liquidating end of season dresses to friends and family. Her experience and entrepreneurial spirit lead to the realization of her dream… her own fashion and clothing line. The name LuLaRoe comes from the name of Deanne’s first 3 granddaughters, Lucy, Lola and Monroe. However, the obvious comparison is that of a more established brand of similar clothing, Lululemon. Whether or not the comparison was intentional, the end result is that LuLaRoe, with what some might consider questionable quality, risked coming across as a cheaper knock-off brand of Lululemon, which is generally regarded as producing high quality clothing. Having an MLM sales model doesn’t help the brand either. But that hasn’t been the case. In an August 2016 interview, CEO Mark Sidham claimed that LuLaroe would soon exceed a billion dollars in sales. So, this is not a small company. As mentioned, LuLaRoe is a multi-level-marketing company… which might be why you’re reading this review. If you’re wondering if this is a good opportunity to have your own fashion business, it all depends on the type of person you are, your financial situation and your current circle of influence. Building a successful MLM business is not easy, and if you’re not the kind of person who likes selling and recruiting, it will be an uphill battle. The challenge get’s even larger when you look at the math. To get started you must purchase 335 pieces of clothing (an onboarding package) at $5134.75 (after discount). The onboarding package includes 6 styles of clothing… but there's a big problem. You don’t get to pick the styles, prints, or sizes. As a result, it’s likely you'll have a legging inventory that doesn’t sell. Even large clothing stores with a lot of traffic get stuck with styles, prints and sizes they can’t sell. LuLaRoe does have return policy subject to shipping costs and restocking fees which I'll talk about below. Not all products are equal when it comes to product management. Food for example, is perishable. You must know your business so that you buy enough, but not too much, or you’ll end up throwing it out. Likewise, clothing is a balance of styles and sizes. How many times have you been to a store and they don’t have your size? All those mediums end up on a clearance rack while dozens of sales are lost due to inaccurate inventory. If you’re starting a business from scratch, have no customer base and no marketing experience, $5000 is a big investment. In addition, you can NOT order single items as you need them. There is a minimum 33-piece order requirement. If you need to order a single size for someone, you will be purchasing 33 pieces of clothing. Therefore, it’s recommend that you have a sufficient inventory of 700-800 items at any given time. The average cost per piece of clothing is $20. That means your suggested inventory will cost you between $14,000 and $16,000. You will also need sufficient space to store these clothes, and an inventory management system so you know what you have without having to dig through boxes. This means that LuLaRoe is not a business you can simply “try out”. If you’re jumping in, you’ll be doing it with both feet (and a box full of leggings). An argument can be made that the high cost of getting started is actually a good thing. 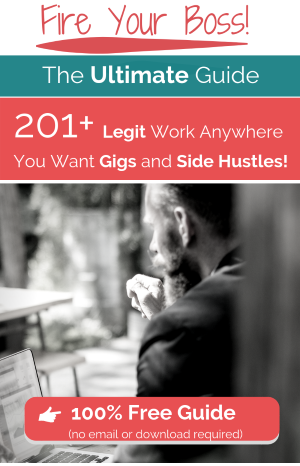 It almost guarantees you’re going to take it seriously and treat it like a real business. But is it really YOUR business? MLM pyramid type businesses have some serious flaws, and one of them is that the business never really belongs to you. The opportunity is sold to you that way, but the reality is quite different. When you join a network marketing company you will sign a contract which requires that you adhere to their rules, policies and procedures. In the case of LuLaRoe, one of those rules relates to inactivity. They can cancel your contract if you don’t meet their minimum sales requirements. Another rule is that you are forbidden to sell non-LuLaRoe clothing to any other LLR independent fashion consultant or retail customer. These are not rules or limitations that a real business owner is bound to. Certain suppliers might have certain rules, but they certainly can’t tell you what products you can and cannot sell. Nor can they shut your entire business down because they don’t like how you’re running it. They can refuse to do business with you, but that doesn’t stop you from running your business. It just means you need to find a better supplier. As someone who owns, and helps others create online businesses, I was surprised by another rule. This rule dictates that you can’t use any ecommerce platform to sell LuLaRoe products. LuLaRoe can't be faulted for having these rules. It's their name, company and reputation on the line. They’re only looking out for their best interests…as they should. But if you decide to become a LuLaRoe fashion consultant, be aware that the business is not really yours. In addition, part of building a multi-level-marketing business is your downline. A lot of time and effort goes into growing your organization, training distributors and working with them to build their personal businesses. What is often not considered, however, is that their entire organization belongs to the company. 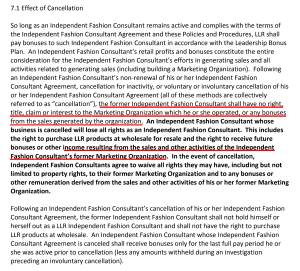 Whether you leave on your own, or get kicked out for inactivity or for violating one of their rules… your entire organization and all future sales belong to LuLaRoe. I know some people will disagree with me that building a Lularoe MLM business is not your own business, but let’s compare it to someone who owns a real home business. I’ll use someone named Katie just as an example. She owns a small network of 6 websites, each earning between $500 - $1000 per month. 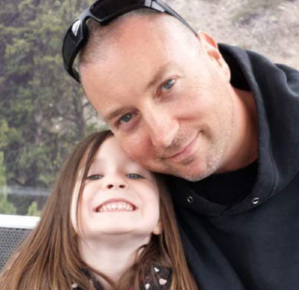 Through a combination of advertising and affiliate marketing she has created a modest income of $3000-$6000 per month from home. Her other 5 websites are unaffected and still generating income. Since Katie has a diverse group of suppliers, not relying on any single affiliate partner, her sixth website is still making money as well. Setting up an account with new affiliate partners is as simple as setting up a new account and changing a few links. The entire ordeal can be managed with a couple hours work and very little (if any) stress. No one can take her business away, it’s hers. She owns it and instead of being dependent on her suppliers or partners, they are dependent on her. Of course, creating an online business isn’t for everyone… but in both examples (MLM or online affiliate business) it will take time and effort to build. With an MLM however, as described in this Lularoe review, the business model means that it's never really yours. In your own an online business, you call the shots. 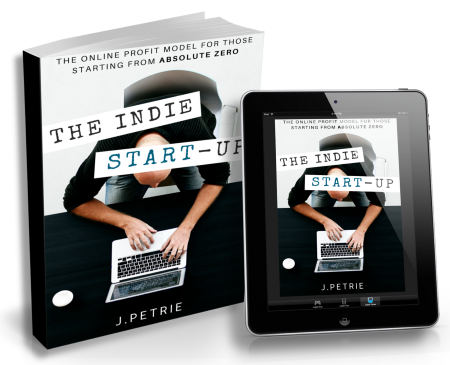 The online profit model for those starting from absolute zero. Is LuLaRoe A Scam or a Pyramid Scheme? No, LuLaRoe is not a scam. Legally they are a legitimate business and not a pyramid scheme. However… although they don’t fit the “legal” definition of a pyramid scheme… no one can say that the overall structure of the organization is not built in such a way. At the top of LuLaRoe's our story page it says, “Through Fashion We Create Freedom”. But the only way to create that freedom is by leveraging the time, money and effort of other people in your downline. In other words, freedom comes from being at the top of the pyramid. The promise is that anyone can do it, that you have an equal chance to be the top of your own Lularoe pyramid (a smaller one within the overall company pyramid). In my opinion, however, not every one has an equal chance. No more than anyone has an equal chance of becoming an A-list actor, a famous singer, or world class athlete. There's a reason for all the Lularoe failure stories online, and consultants explaining why they quit. And, it's not because they didn't work hard, or do the right things. It’s true, hard work is required. But talent and unique circumstances are required as well. And the success rate of MLM’s don’t lie. Statistically, 99% of people in MLM’s don’t make money. It takes a rare personality, a specific skill-set, and the uncommon ability to handle consistent rejection. People don’t like to talk about this, but at some level, they know it’s true. Also, people who succeed at MLM’s often start with a unique network of people they can tap into, such as a church or community center. They may own a business like a dance studio for example, or they may have a social media or personal blog following. None of that says you can’t succeed with a LuLaRoe business. You certainly can. Especially if you provide better service than Chrissy at Clumsy Gourmet received when trying to buy a pair of Lularoe Leggings. ​The numbers (compensation) are real and LuLaRoe does have its success stories. You may be one of those people with a special charisma that people gravitate towards. We've talked about the upfront cost and investment. But to get more into the full compensation plan, I thought it would be best explained by someone involved. Please note: I don't endorse the following video, but for informational purposes, it explains the compensation plan well. LuLaRoe has a few things going for it, and one of those is fashion. Unlike some other MLM that may have trivial products, many people have a “passion for fashion”. My daughter, for years, has been dreaming about starting her own fashion business when she grows up (she’s only eleven). So, the product I think separates LuLaRoe from a lot of other multi-level-marketing opportunities that are otherwise boring and uninspired. The high-cost of getting started, however, also separates LuLaRoe from other MLM’s… not to mention the physical space required to manage a large inventory. Do you have a vehicle? Since the primary method of marketing is home parties, or what LuLaRoe calls ‘Pop Up Boutiques’, you will need a way to get yourself and your wares around. If the financial and logistical challenges are not a problem, the next thing you need to ask yourself, is whether or not selling and recruiting is something you want to do long-term. Remember, they can kick you out for inactivity and, if for any reason you want to stop or get out… your business and organization belongs to them. They do have a Cancelation of Agreement procedure. If you decide to begin the exiting process and quit, LuLaRoe has a buyback policy. They will buy back your inventory for 90% of your purchase price. This applies to clothing items they decide are resalable. But, in addition to losing ten percent, you will also be on the hook for all shipping costs. LuLaRoe also allows you to sell your business under certain circumstances… but whether or not you can find a buyer and sell it for a profit depends on whether or not it’s making money, what kind of inventory you’re stuck with, and a bunch of other factors. If for example you live in small town and there are 8 other people selling LuLaRoe, it might be a hard sell. When you’re investing potentially tens of thousands of dollars, these are all things you need to consider before getting started. Money and logistics aside, recruiting is the biggest roadblock for most people. 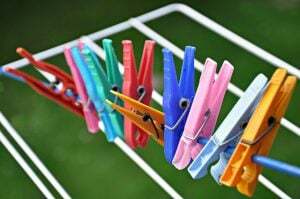 Unlike products such as soaps and cosmetics, clothing is not a consumable product. Your original sales will probably come from friends and family… but after that first month, they won’t need you to re-stock their closets. That means you will have to find a way to sell to people you don’t know… and if you want to build your organization (which is critical to create a passive income lifestyle), you’ll have to do what most people don’t like doing. People don’t like recruiting, and… people also don’t like being recruited. This is where most MLM businesses fall apart. It’s where people spend most of their time, and yet, it’s the part they hate doing the most. It’s the only path to building true independence (which, as mentioned before, you never really have within an MLM). The pitch is that you’re just sharing an opportunity, how hard can that be, right? But again, the numbers don’t lie. If it were easy, if it didn’t bother people to do it, the success rate would be higher. The numbers here are buried in a complicated matrix, because statistically, they are not in your favor. If they were, not only would they be easy to understand… they’d also be front and center on the LuLaRoe homepage. If we dig a little deeper, you’ll see that less than 1%... in fact, only .61% reach Coach level. That's 6 out of 1000 people. The level below that (Trainer) accounts for only 4.89%, which pays an average annual bonus payout of $52,353.30. 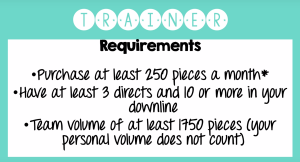 Fifty thousand a year (not month) doesn’t seem too bad, however, to qualify for those bonuses (at the Trainer level) every month you must purchase 250 pieces of clothing (approx. $5000 worth of inventory). Not including your purchases, your team also needs to buy 1750 pieces of clothing (approx. $35,000 worth of inventory). That's a total of $40,000 inventory per month. The assumption is that you have the retail and downline sales capacity to sell 2000 pieces of clothing ($50,000 to $70,000 retail sales) every month. It's doable, but that's a significant undertaking. If you're hoping to become a millionaire or high six-figure earner, it's important to set aside any "presentation hype" and do the math yourself. And because a small percentage of your downline will be able to buy hundreds of pieces of clothing every month (or any month for that matter), you’ll need to recruit a lot of people. I’m not sure if bumping up your personal purchases contributes to the team total… but if it does, you can bet that many Trainers have done just that to make sure they get that bonus payment. It’s entirely possible to earn money with LuLaRoe, people are doing it… but again, there is a reason more than 95% of people who join never reach this level. And, the income disclosure agreement does not include the distributors expenses, the amount of inventory they’ve either been stuck with, as well as restocking fees (15-25 percent) or shipping and handling costs. The opportunity exists at LuLaRoe, but the price to get started is high (relative to other opportunities), and your chance of success (statistically speaking) is low. Before the internet, MLM’s were a good opportunity for people to starting home- based businesses. But, in today’s world, there are just better options in my opinion. …and most importantly… never have to recruit people. As mentioned earlier, your business is also your own. These are significant advantages MLM’s can’t compete with. It's the reason I’ve chosen the online model for my own home based business, and why I recommend it to others. I hope my LuLaRoe review was helpful and covered the key points you were looking for. Please leave a comment below; your opinions are valuable. Do you have experience with Lularoe? If you've read this complete Lularoe review, starting a real home-based business is obviously something you want to do. Although multi-level-marketing is a step in the right direction... as mentioned, it's not really YOUR business. To truly build a home business that's both independent and diverse, online marketing is the undisputed king. This is very nice post. It is also very helpful for us. I have been searching this types of article. Some days ago I read an article about clothing, but this post is better than post. I admire MLM companies for being generous. At one time, I even blogged about it and compared it to affiliate marketing that’s generous in giving away commissions. Imagine, instead of just paying you based on your personal sales, you are going to receive commissions from the sales of your referred affiliates? Very generous. Theres’ only one thing that I didn’t like with MLM, even with the legit ones: To be able to promote their products, you have to be a customer yourself mandatory. So, with that, the truth is, you’re one of their customers. You are actually their target customers. So, if Lularoe is claiming “we want you to become our business partners”, what they actually mean is, “we want you to become one of our customers.” You are being targeted as a customer!